The web presence for Global MIT had become outdated. Meanwhile, a shift in the management of global activities to the Office of the Provost provided an opportunity to tell the story of MIT’s impact in international engagement in a more cohesive way. We met with the client to understand the vision for the new site: a repository of MIT’s global projects filterable by key themes, such as education, collaboration, country, and research area. Our team developed the RFP, created a model of the site’s functionality, and worked with the client to select the designer, developer, and writer for the project. We served as project manager by overseeing the creative team, managing the schedule, and providing ongoing support post launch. The redesigned site has been praised for its simplicity in both design and functionality, and it has become a model of demonstrating MIT’s global reach. Analytics speaks to its global reach: The site is visited annually by an average of 20,000 international visitors — with notable visits from India, Russia, and China. 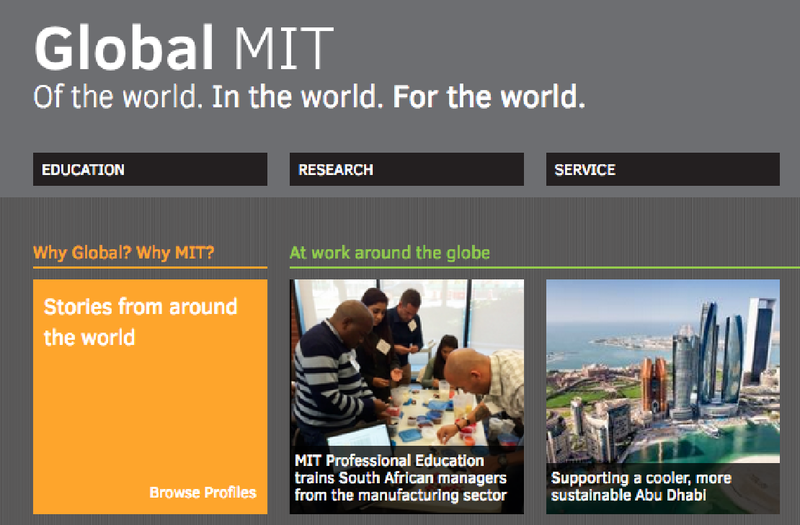 Visit the Global MIT site.